ZuksOffRoad and GOT-PROPANE.COM are working together to get you all the benefits of Propane and Turbo. A inexpensive way to run at any angle with high octane propane that loves to be boosted. This kit does not include any GOT-PROPANE parts. We can help by selling you the correct GOT-PROPANE kit. Cary at GOT-PROPANE can also sell the GOT-Turbo if you want one stop shopping. ZOR KO3 exhaust log with gaskets and studs. 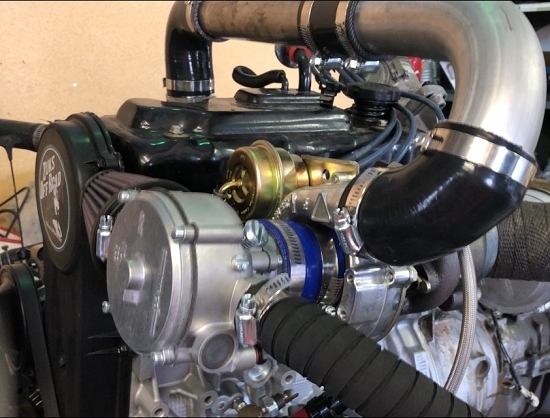 KO3 turbo with fittings and hardware. 2.5" Exhaust exit flange and 2.5" tight elbow. Oil feed line and fittings. Oil drain line and fittings (bung must be welded into your oil pan if you are not buying the oil pan option). Charge tube and hoses with clamps. Shipping to the lower 48 states. Note: NEVER break a re-manufactured engine in on PROPANE. We sell new engines that are propane ready and shipped with turbo installed if you pay for that service. These are custom made and based on building exhaust logs as fast as possible. Typical ship time is 3-5 weeks during busy season. MY-TURBO for Suzuki Samurai 1.3 usIng Harley CV Carb.